Bring vision to the table. To some, an occasional table is just a table. Craftsmen of the Keystone Collection know otherwise. They relish the fine points and recognize the rich feel and finish of solid hardwood. The Amish Mission Square Coffee Table brings an exquisite solid wood coffee table to your family room or living room display. Enjoy the convenience of a coffee table to hold your reading materials and beverages while it stores remotes and glasses. Display the beauty of American made solid wood furniture that stands out from the rest. This mission coffee table offers two drawers to conceal contents, making it easy to clear the coffee table when company drops by. This mission furniture is shown here in solid oak wood. Oak furniture is durable and resistant to wear and tear, making it a great candidate for furniture that sees daily use. For creative ideas involving accent tables, be sure to check out our blog post, Accent Tables as Design Statements. Experience the luxury that is Keystone. Browse our Keystone Collections Furniture for the quality you're looking for in every room of your home. 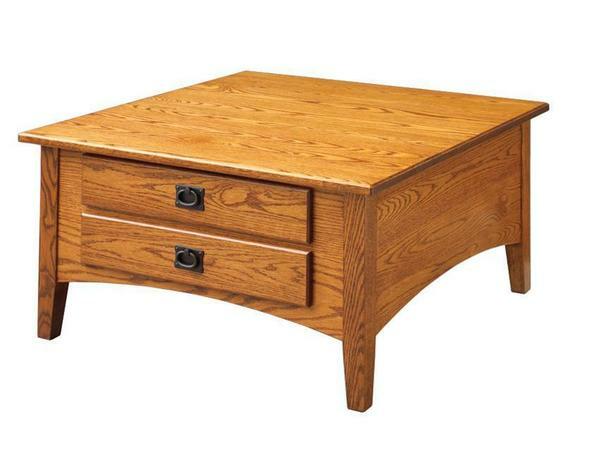 Let our skilled Amish craftsmen create an original for your living room. Select from red oak, cherry, clear maple or quarter sawn white oak with rustic versions also available. *Lifetime Guarantee - Integrity of Workmanship gives you peace of mind. Should your furniture fail because of defective workmanship during the lifetime of the original owner, we will repair or replace it. Normal wear, misuse, alterations, commercial use, finish, and seasonal splits are excluded. Antiquity Distressing - Light distressing, pin holes and expert glazing to replicate a rich natural patina are among the subtle hints of graceful aging that make this lightly antiqued finish so popular. Vintage Distressing - The techniques of our Keystone Antiquity Finish are taken a step further with medium distressing, lightly eased edges and hand-brushed highlighting to add a century of age to the appearance. Legacy Distressing - Our ultimate antique finish. Wear through of the rich patina is punctuated masterfully with another level of nicks, simulated cracks and other distressing techniques to give the look and feel of several centuries of robust wear. Weathered Distressing - Available on Oak, Rustic Oak, Quarter Sawn White Oak and Rustic Quarter Sawn White Oak Wood Species Only. This finish has a weathered hand distressing using wire brushing, slight indentations, medium eased worn edges, random hand-carved out along edges and no wear-through. Medium hand-burnishing as well as a flat sheen is used. Artisan Distressing - Artisan hand distressing with medium amounts of indentations and pinholes. Heavy eased "worn" edges as well as random "hand-carve out" along edges. No wear through, medium hand-burnishing, hand-rubbed glazing and a regular semi-gloss sheen. Hand Hewn Distressing - This package is available only on the rustic wood species. Medium Hand distressing, medium indentations with medium amount of pinholes, medium rasp markings, medium eased edges, medium wear-through, light hand-burnishing, hand-rubbed glazing, hand hewn tops, hand pegged tops and semi-gloss sheen. Hand Hewn Distressing with Vintage Distressing - This package is available only on the rustic wood species. Medium Hand distressing, medium indentations with medium amount of pinholes, medium rasp markings, medium eased edges, medium wear-through, light hand-burnishing, hand-rubbed glazing, hand hewn tops, hand pegged tops, hand-brushed highlighting to add a century of age to the appearance with regular semi-gloss sheen. Shown in Oak Wood with Harvest Stain.